David Hoffman. A Lecture, Introductory to a Course of Lectures, Now Delivering in the University of Maryland (Baltimore: Printed by John D. Toy, 1823). 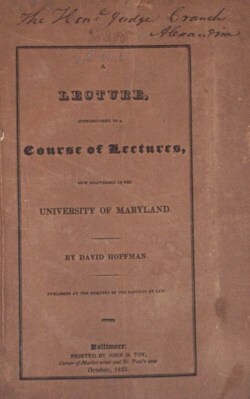 This pamphlet contains David Hoffman’s first lecture to law students at the University of Maryland. Professor Hoffman (1784-1854), a prominent Baltimore lawyer and legal educator, was one of the founders of the Law Institute at the fledgling University of Maryland. His Course of Legal Study (Baltimore, 1817) won international acclaim, for Hoffman did not limit his work to Anglo-American legal principles, but examined Roman law and Continental jurisprudence. Joseph Story wrote of “the enlarged and liberal view with which Mr. Hoffman recommends the student of the common law to a full and careful study of the admiralty, maritime and civil law.” In 1836, Hoffman wrote the first maxims of American legal ethics, Fifty Resolutions in Regard to Professional Deportment. The American Bar Association’s original 32 Canons of Professional Ethics (1908) can be traced to Hoffman’s Fifty Resolutions. Reporter of the U.S. Supreme Court William Cranch (1769-1855), judge of the Circuit Court of the District of Columbia, was one of the first two law professors at GW Law’s first incarnation, the Columbian College Law Department (1826-1827). Judge Cranch began his teaching duties in June, 1826, not quite three years after publication of Hoffman’s Lecture. Hoffman and Cranch were among the pioneers in university-affiliated American legal education, with Hoffman slightly ahead; in preparing his law school lectures, Judge Cranch may have turned to Hoffman’s work for guidance as he embarked upon his own experiment in Washington, DC.